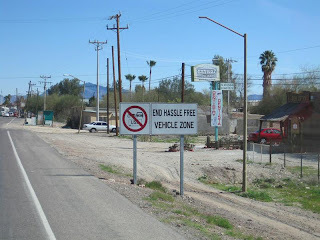 Yesterday we made the 190 mile trip from Puerto Penasco, Mexico to Lake Pleasant Regional Park on the northwest side of Phoenix. 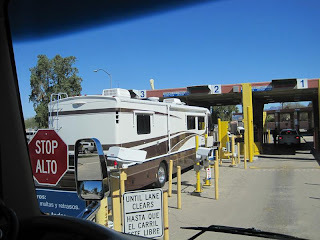 After carefully maneuvering out of the crowded park we followed Bob and Linda north to the border crossing at Lukeville, AZ. In spite of a long line we were through there in 10 minutes. 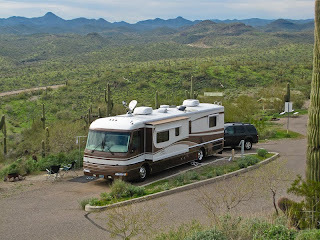 Since Bob and Linda were going to stop in Organ Pipe National Monument for a few days we pulled over to say our goodbyes. We enjoyed our time in Mexico with them and are grateful that they took a couple of novices under their wings for our first trip to Mexico. We are going to miss their company and wish them safe travels as they start a slow trip north to Alaska. 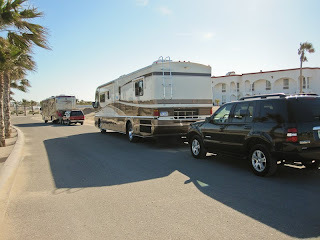 You can keep up with their travels at Linda's blog. 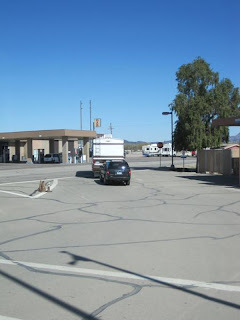 We originally were going to stop in Gila Bend for the night because we needed to pick up our mail. But we got there early, picked up our mail and decided to move on. We found a site and were soon settled in even though we couldn't get the coach level. We try to be careful using the leveling jacks because a few years ago we cracked the windshield trying to get level. We settled for tolerable. This morning we went on a scouting trip and found a much better site. Since we are going to be here until next Tuesday we decided to change sites. We went through our normal departure routine, but I got in a hurry. While the TV Satellite dish was lowering, I unhooked the power. There was a brief power interruption before the inverter kicked in. It was off long enough to screw up the dish. 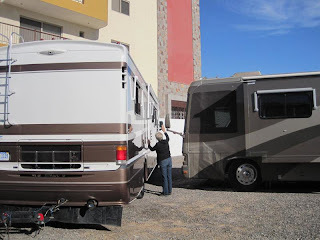 A trip to the top of the motor home and checking connections proved useless. I came down and called Motosat to see if they could help, since we couldn't move with the dish partway up. After a 5 minute wait on hold a young man was able to help me get the dish down. It turns out that I corrupted the memory by unplugging the power. He walked me through reprogramming the controller and 10 minutes later we had the dish down. I stopped by the dump station while Judy went on ahead to make sure someone else didn't take our new favorite spot. The sites here are all "first come, first served". This new site is very level and has great views of the valley and distant mountains, complete with Saguaro cactus. 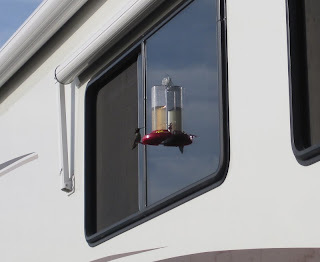 We settled in and set up the bird feeders and soon had 2 hummingbirds at the feeder. This afternoon Mollie took us for a walk and we met some nice people who had a little dog that Mollie liked. They invited us to sit for a while and we had a nice visit. 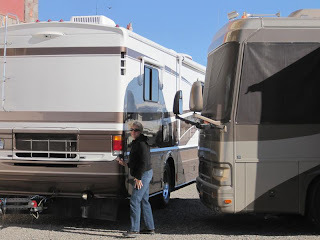 They are from Montana and had just purchased a new to them 5th wheel. Nice folks. We enjoyed a glass of wine watching the sun slip behind the mountains and then cooked dinner on the grill. All in all a nice day.